FREE SHIPPING SITE-WIDE. Every Order is Verified By AgeChecker. Thank You For Your Purchase with ELiquid Universe, Inc.
Mallow Man eJuice by Keep It 100 brings you a delicious, warm, chewy sugar cookie smothered with fluffy, goooooey marshmallows. Our mission at CBDResellers.com is simple - to provide our customers with the best quality, highest purity and top potency of any other CBD products on the market today. © 2019 ELiquidUniverse.com. © 2018 ELiquidUniverse.com. An ELiquid Universe, Inc. Company. All Logos, Graphics, Slogans, & Mottos, Such as "Real. Pure. ELiquids. ©", & "The Dragon Liquids Brand™" are protected under US Trademark & Copyright Protection - © Copyright 2018. The Dragon Liquids Brand™ Featured on VAPEMagazine.com, PremiumEJuices.com, PremiumELiquids.com, Ejuices.co, Eliquids.com, Ejuices.com, MidWestGoods.com, VapeRanger.com and many other websites, Vape Shops, and Distributors – All Other Brands that “we” Retail, Wholesale, or Distribute are also protected under US Trademark and Copyright Protection from the respective companies. FDA DISCLOSURE: These statements have not been evaluated by the FDA and are not intended to diagnose, treat or cure any disease. Always check with your physician before starting a new dietary supplement program.THIS PRODUCT IS NOT FOR SALE TO MINORS UNDER THE AGE OF 18. CALIFORNIA PROPOSITION 65 WARNING: This product contains chemicals known to the State of California to cause cancer and birth defects or other reproductive harm. JUUL is a registered trademark of JUUL Labs, Inc. ELiquid Universe Inc is not associated with Juul or Juul Labs in any way. Our Vape Pods or Airbender CBD Drip Pods are not affiliated with or endorsed by Juul or Juul Labs in any way. Join Our Mailing List & Receive Exclusive Discounts, Be The First to Know About Special Promotions + Receive a Welcome Email with an Introductory Discount Code! You can Opt Out Anytime & We fully support & comply with the CAN-SPAM Act. 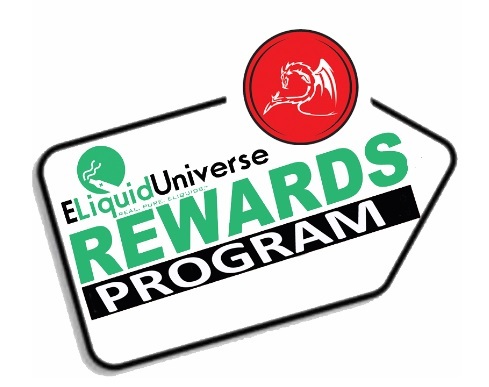 We would Like to Give Back to Our Amazing Customers By Introducing our New Rewards Program! Welcome to the New ELU Rewards Central! No more Discount Codes or redemptions necessary! It's Simple! Earn 2% Cashback on every Purchase you make and you now can directly purchase an item with your Vape Cash! Under every Item you'll notice Add to Cart or Pay with Vape Cash! It's that Simple! Also, we have many other ways for you to redeem Vape Cash! Make a Referral, Share an Item on Social Media are just a few! If you were a member of our previous rewards program all of your points have been imported and converted!